It is exceeding rare for competing developers to coordinate their building plans and produce projects that are mutually complimentary, if not beneficial. It is even rarer for such developments to have significant benefit for the city. This is such an example. The coordination, however, did not come easily and was negotiated by New York State Supreme Court Justice Edward J. Greenfield. 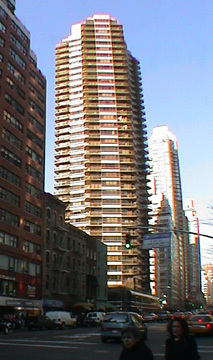 In 1984, Donald Trump built this very glossy but attractive 39-story, 175-unit cooperative apartment tower with a low-rise retail base that extended the full-blockfront on the avenue to 62nd Street. Lo and behold, two years later in 1986 Morton L. Olshan and his partners began building a 42-story, 234-unit condominium, catty-corner clone, called the Savoy (see The City Review article)! Mr. Trump, ever vigilant, filed a law suit against Olshan to make sure the project was different from his and the case was settled out of court after the judge dictated specific changes in the façade materials of Mr. Olshan's project. The Olshan version is slightly different with a shinier base and more angled balconies, but from a distance these towers could almost be twins. More important, together they serve as a major gateway to the Upper East Side from the very hectic and important entrance and exit to the Queensborough Bridge and Bloomingdale's. 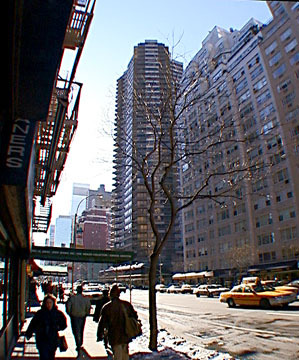 Philip Birnbaum & Associates designed both buildings and Paul Goldberger noted in a column in The New York Times that Trump Plaza "could not be called distinguished, but it surely glitters amid the banality of the rest of Third Avenue." "Whose property was that building's design?" Goldberger asked. Normally, he continued, it belongs to the architect to prevent builders from re-using designs without permission. Justice Greenfield, Goldberger reported, noted that Birnbaum's contract with Trump provided that the architect not use the drawings for another project and maintained that "a knockoff of a known product is unfair competition." Goldberger remarked that the settlement in the case "sets an important precedent, for it is based on the premise that the design of a building is protected not only by copyright but also by the laws and customs of the commercial marketplace." "Twin buildings would not have helped Mr. Trump's marketing effort much, for they would have made Trump Plaza less of a special product. But they would have been reasonable urban design in a city in desperate need of more coherence on its streetscape. On the other hand, Mr. Birnbaum's record of concern for the streetscape is not a good one, and it is hard not to think that at Trump Plaza he had simply been pushed into doing something different from his usual work, knew that he had a winner in that design and wanted to duplicate his success. In the end, this case was less about architecture than it was about marketing - which might, of course, be said about the whole business of real estate in the first place. Both Mr. Trump and Mr. Olshan issued press releases hat suggested they had prevailed in the settlement, a probable sign of the Justice's wisdom," Goldberger wrote. Which three-winged tower is better is hard to decide. The Savoy, which is on the south side of 61st Street, has a flashier and more attractive base with a brightly colored, trellised sundeck on its setback, while Trump's tower, which is on the north side of 61st Street, has a form that is a bit more soothing and a bit further removed from the area's hubbub and a bit closer to Central Park. By contemporary standards, both were far above the norm, although they both have disappointing low ceilings despite the regular roundup of amenities such as health club, concierge, garage and sundeck. The trefoil layout of each tower, of course, is the real winner, opening up unusual vistas and angles for both residents and passersby. 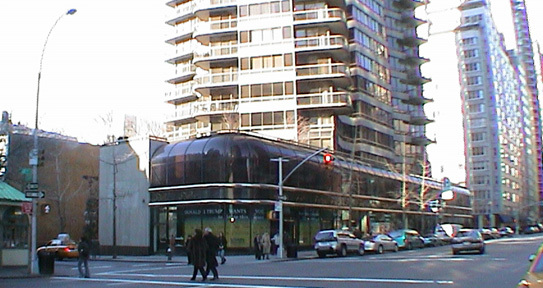 The retail base of the building has a high curved glass second floor above two brass string courses. It is an impressive unified retail frontage. The southernmost store for many years was occupied by a handsome and very popular restaurant but the space remained vacant for some time in 2003 and 2004.